Stanground rod Dave Schwinger is a hard man to beat at Float Fish Farm Fishery right now, particularly in the regular Wednesday Over 50s matches. 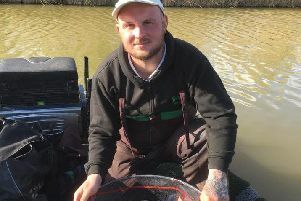 He made it two wins out of two when topping the field with 55lb 3oz - all taken on the pole feeding a few maggots on a little but often basis, and fishing double dead reds on the hook. Second was Vince Hull on 49lb 2oz followed by Mick Linnell with 44lb 11oz. It was a busy day for most of the anglers fishing the latest Open match run by Ramsey & District Angling Society on the Ramsey St Mary’s section of the Old Nene. Top rod with well over 200 small fish was Keith Rayment, who fished the pole with pinkie over a bed of groundbait for 7lb 11oz. Runner-up Simon Wagstaff was the one exception to the rule. He fished the long pole with a chopped worm and caster approach and it paid off. He took lots of perch and a bonus tench for 7lb 8oz. Ken Taylor came in third with 6lb 9oz followed by Harry Young on 5lb 9oz. Whittlesey AA, Queensway: 1 John Taylor 3lb 12oz; 2 Arthur Smallaman 2lb 7½oz; 3 Frank Bevilacqua 2lb 4½oz.